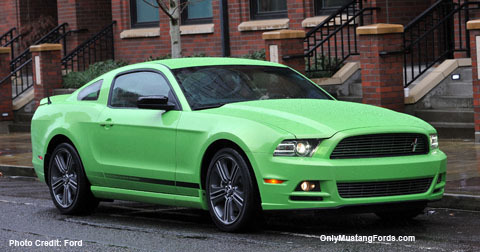 The 2013 Ford Mustang delivers more refinement and impressive specs. With newly enhanced muscular styling and chassis development, this new muscular Mustang is clearly out there to kick some asphalt. And horsepower? Yes, there's more of that too in the beautiful 2013 GT! Starting with an already great looking design and dramatic improvement in performance, Ford's engineers have been busy creating even more fun for the pony car enthusiast. With improvements to the Mustang GT and the continuing development of the Boss 302, Ford's 2013 Mustangs are ready to take on all comers. 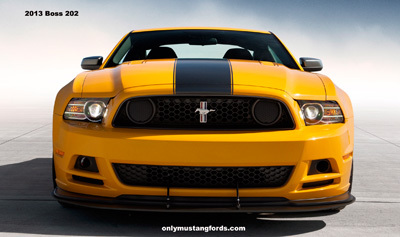 The most significant changes to the 2013 Mustang design, are the more muscular front end modifications. All models, from the base V6 pony to the Boss 302 receive a more angular, substantial styling change, which immediately add to the already impressive performance forward styling. The V6 and GT models their small chin spoilers. Both receive a slightly more aggressive and powerful hood re-design. Along with these styling changes to the hood for all models, the impressive Ford coyote V8 powered 2013 Mustang GT models and the new Boss 302 cars, received and added and cool, new (and apparently functional) pair of intake louvers, which Ford refers to as heat extractors . 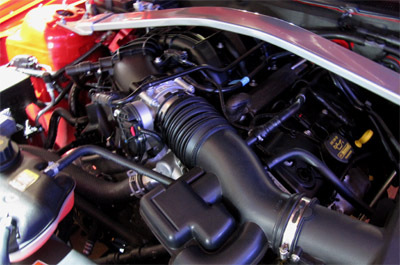 These add-ons were designed to pull heat out of the engine compartment and aid in engine cooling. Changes to the interior of the 2013 Ford Mustang are relatively minor overall, but include a few particularly memorable new additions to the Boss 302 and 2013 Boss Laguna Seca models, including a really cool display function between the round speedometer cluster on the left and tach/gas/ oil display on the right. Yep. That's right, it's a little drag racing Christmas tree, complete with settings that allow you to record and review not only your quarter mile times, but braking and handling performance! More on this in the 2013 Boss 302 section. To my mind, that's the kind of thing that should be on every Mustang model, if for no other reason than bragging rights. The other significant addition, for the 2013 Mustang V6 cars, is the ability to check the option box and get a pair of the same Recaro® bucket seats, that were previously, only available on the Boss 302 and Shelby GT500 cars. Ford's Mustang V6 powered pony cars, received a power boost last year of almost 100 horsepower, bumping them to an impressive 305 horsepower while posting equally impressive gas mileage numbers (up to 31 mpg highway). No new performance was added to the V6 powerplant, but the already hugely impressive and powerful Ford Coyote V8's, have received a further power bump, and now are up to 420 horsepower. That's stock block, drive it everyday and scare the pants off your dear old grandmother power. Who said the days of the factory muscle cars were over? If you drive a stick and live in an area with a lot of up hill stop signs and traffic lights, you'll be pleased to see this new option on your 2013 Ford Mustang. Coined "hill start assist", the new feature is activated when the brake pedal is pressed and the car detects that you are on a slope. Rather than the usual handbrake/clutch gas start, that can sometimes cause you to roll backward on a hill start, the system holds brake pressure for up to 2 seconds, allowing the driver to apply the gas and ease out the clutch. Wouldn't be a bad thing for the automatic optioned cars either. By itself, the 2013 Ford Mustang GT has received many significant improvements and refinements. 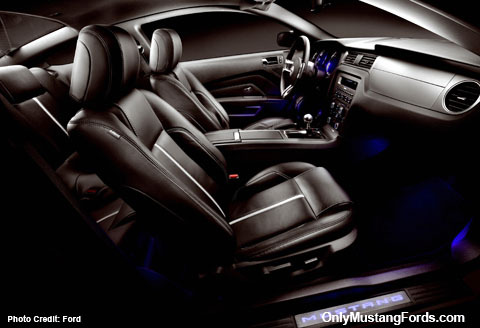 Full details, pictures and specs can be found in the 2013 Mustang GT section. As we mark the passing of the legend who created the iconic Shelby Mustangs, Mr. Caroll Shelby, we are at the same time, happy to say that the new 2013 Shelby GT500 Mustang is even better then before. Dying to take one out for a spin? 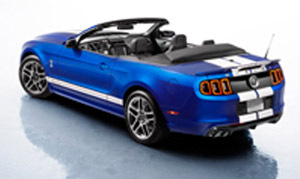 Here's a link to the all new 2013 Shelby GT500 video and our 2013 GT500 first drive. The Boss 302 is yet another epic story for those fortunate enough to own one. And the engineers at Ford didn't disappoint us with their yeoman work on the new 2013 Mustang Boss. Increasing horsepower wasn't the priority for the second incarnation of the famous Mark Donohue Boss 202 Mustang. Using what they'd learned at the track and on the road, great effort was made to further refine and improve an already formidable package. Chassis tuning and suspension refinements, coupled with some cool and useable new electronics make the new factory road racer even more potent. There's just too much information to get it all down on one page, so click the following link for the full 2013 Boss 302 specs , pictures and more detailed information. It wasn't long ago that you had one of two choices buying your favorite pony car. Either you had the more powerful V8 engine and the performance you expect when driving a new Mustang, or a little 4 cylinder or 6 cylinder engine that's great on gas but short on oomph. Well, not any more! The new 2013 Mustang V6 combines the best of both worlds and finally presents a great option for those folks who do a lot of driving and still want to feel that push into the seat when you have your foot in it. Here's the full V6 Mustang article. Ford has announced a new milestone for the Taiwanese market, the introduction of a special limited edition pony car. Check the link for new pictures and the full Mustang in Taiwan story. If you own an iPod, iPhone, iPad, or Android device, there's a cool free 2013 Mustang game created by Ford that you can download, that lets you create your own custom pony car or Shelby GT500 and then race it in a drift challenge on your iPhone, iPad, or Android powered phone. Here's the link that shows you how to get your free 2013 Mustang Game . Ford has been making big inroads getting your favorite sports GT car to the world. And if you live in the Philippines, you'll be happy to hear that it's now available locally. Here's the full story on the 2013 Ford Mustangs in the Philippines.